There are minor spoilers ahead, but nothing you haven't seen if you've already read Green Lantern Corps from two weeks ago. 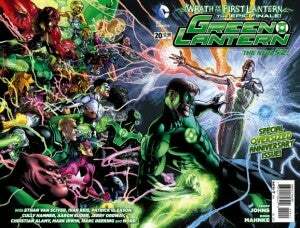 Geoff Johns's nine-year run on Green Lantern has not been without its flaws, but it will without a doubt go down as one of the great runs on any Big Two book ever published. That makes today's issue all the more impressive; Johns does a few things that are virtually impossible to do and, by virtue of pulling them off, creates what's arguably the single best issue of Green Lantern ever written. If not that, it unambiguously represents a high water mark for the character and the series. Johns has consistently drawn criticism for his endings; he's been known to introduce a great idea and then spend a storyline building it up, only to have the final conclusion seem a little too "easy." He and Mahnke avoid that here, giving a sense of scope and threat that would have been hard to match if his book weren't expanded well beyond the paramaters of the average monthly comic. The oversized "anniversary issue" is rarely used as well as you'd hope, but here it's just right. It feels as though Johns just wrote the script he wanted to write, and then submitted it and had it drawn, rather than trying to cram into a standard size or pad it out to a larger standard size for an annual-type story. 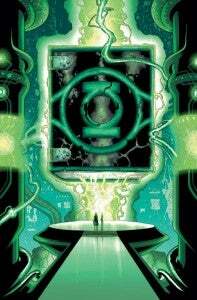 The team manages to wrap up the current story while giving the larger book a framing device (set in the future, the finale is told to a young Green Lantern recruit) that serves as a "Whatever Happened to the Emerald Warrior?" story. Alan Moore's Superman story is no doubt one of the great finales of all time, and this one surpasses it, in my opinion, because it's saddled with the extra responsibility of resolving the ongoing stories in a direct and specific way, and succeeds in doing so while still creating a compelling and satisfying narrative for those looking back from the future. Hal's life--and those of the other supporting players included in this story--have become myth in the future, and we get to see not only the resolution of the ongoing "Wrath of the First Lantern" story but all of their stories--we see our heroes aged and happy, with loved ones and inside jokes and all of the things that you hope your heroes have earned themselves by the time they hang up the tights. It's reminiscent of Johns's final issue with Wally West's Flash, which up until now was the standard by which Johns's finales were judged. That kind of story is remarkably hard to pull off, because it always reeks of finality and as anyone who's been reading comics knows, nothing is ever final. Johns, however, makes it work simply because of what it is he's closing the door on. This comic feels like it could be the final-ever chapter of Green Lantern, and there will certainly be a generation of readers for whom Johns's run is so definitive that it's all they'll feel the urge to own in trade. The other, even more difficult thing that Johns accomplishes is that he throws almost everything from his long run at the wall. Dozens of characters appear, including heroes and villains you never thought you'd see popping in for a cameo. Long-teased stories get a big payoff, including some for which Johns wasn't the first guy to attempt the maneuver. None of it falls flat or feels like it's in there just to be in there; the issue feels like a true culmination of long-term planning by the creative team, and that sense of scope is part of what elevates it from being a good ending to the storyline to being a modern classic. Even the status quo-altering moves Johns makes here are more for closing up shop on his run than they are for setting up the next generation. It's hard to ignore the fact that they'll alter the character dynamic of the Green Lantern titles...but given the inclination, the biggest changes Johns implements can be essentially ignored by the next guy if that's what they elect to do. It's been done before, in an almost identical fashion. 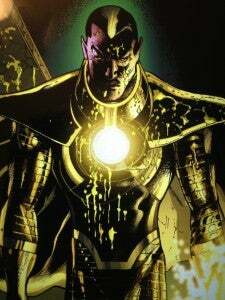 And then there's Sinestro. 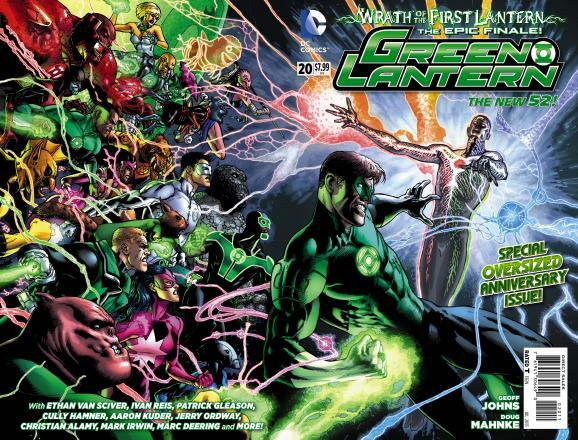 An aspect of his story was spoiled in an issue of Green Lantern Corps which, originally scheduled to ship after Green Lantern #20, ended up shipping before due to a production delay in Johns's finale. That element, though, is far from the only thing that happens to the character in this issue and if there's one major takeaway from Green Lantern #20 it's the reminder that Johns has consistently made the book as much about Sinestro as about Hal Jordan himself. It's hard not to hope that the next creative team will give Sinestro a nice, long break. Bringing him back in as the villain of the week anytime soon will really undercut what they managed to do here. 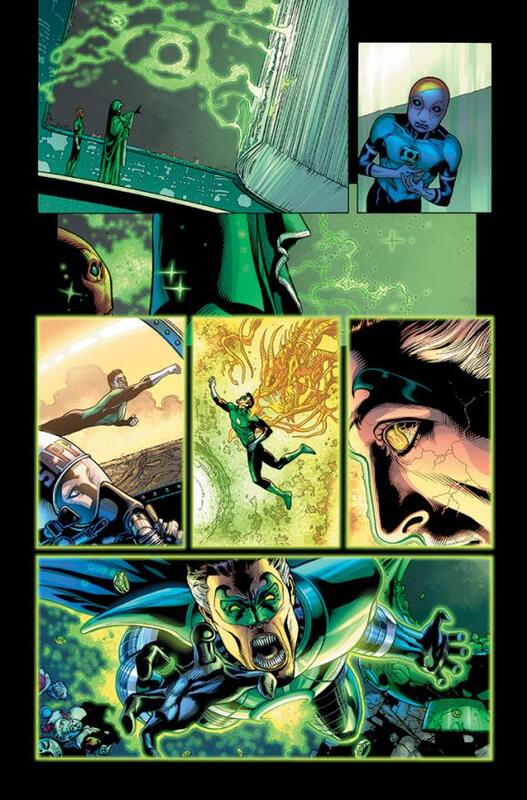 There is, in fact, a beautiful symmetry between Sinestro's fate at the end of "Wrath of the First Lantern" and Hal Jordan's fate at the end of "Emerald Twilight," the story that forever altered the Lantern dynamic and set the stage for Johns to bring Hal back in dramatic fashion years ago. His home destroyed, he finds himself rather without hope--that hopelessness brings him face to face with fear. The difference, of course, is that after a decade of Johns stories, the mythology of the Green Lantern universe has been laid bare for the characters. 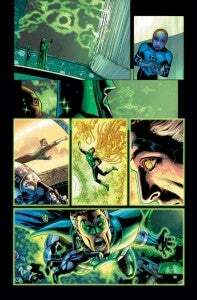 While Hal Jordan succumbed to Parallax once upon a time, largely because he didn't know he was in any danger of doing so, Sinestro approaches the entity a bit differently. While Johns, who is already a Green Lantern legend, will doubtlessly get a lot of the credit for this nearly-flawless finale, Doug Mahnke deserves a heap of praise as well. His unique visual style was one that many fans had doubts about following up on the sleek and commercial look of Ivan Reis, but he's long since left those doubts in the dust and turns in here a beautiful issue, with some of the most effective uses of space you'll see outside of art comics. The oversized issue isn't just a single-issue story stretched out with a bunch of splash pages, as happens from time to time in comics. Rather, pages are crammed with action, movement, panels and dialogue. The handful of splash or splashy images that Mahnke gets to do, he nails--but this isn't the Green Lantern of Ethan Van Sciver. Gone are the beautiful portraits that look like somebody's posing for a picture. Mahnke's art is kinetic; even when people are standing still, there's a sense of energy and motion. And the issue's turning point--featuring a holy-crap-they-just-did-that moment in the writing, is highlighted by a page that looks like it was pulled straight from the Gil Kane playbook. This issue is the finale Green Lantern fans are hoping for and, more importantly, it's the finale that Johns's epic run on Green Lantern deserves.